Don’t be fooled by the name, the food is what steals the show at Kaffeine. 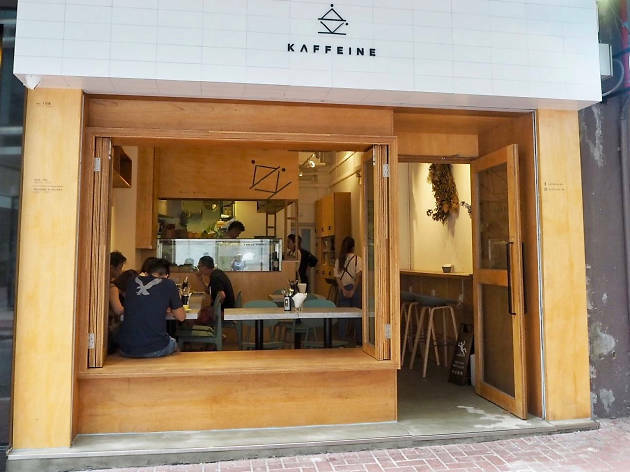 The latest addition to Sheung Wan’s already heaving coffee scene, Kaffeine sits on Jervois Street, in a neighbourhood already well served by Cupping Room, Why 50, Coffeeholic and 18 Gram’s Coffee Roastery Lab, all of which are within a minute’s walk. Despite the local competition, Kaffeine is heaving when we arrive. It’s a small location but the café makes the most of it, the front window opening to provide additional spots to perch and people watch. The interior is simple: white and grey tones together with the wooden tabletops and shelving create an almost cosy lounge effect. With attentive and friendly staff on hand, it’s all very welcoming. The coffee menu is standard for the most part, though more interesting options include an iced Baileys mocha ($58) and affogato with homemade tiramisu ($58). Serious javaheads might recoil at such adulteration but we order the former and an americano to see how Kaffeine handles its, well, caffeine. Both results are satisfactory; nothing to write home about but a cut above the syrupy brews offered up at chain coffee shops. Where Kaffeine really shines is its food. The lunch menu runs from midday to 2.30pm daily and offers a variety of dishes from a simple vegetarian risotto ($88) through to an Australian wagyu beef burger ($148), all of which include a small mixed salad or a soup of the day. We opt for the former, with salad, and are impressed by the healthy yet sumptuous and moreish combination it is. The salad options change daily and are notably fresh, colourful and distinctly different – if that’s all you’re after, order up a bowl and mix three of your choosing ($88). Despite its name, don't be fooled into thinking that Kaffeine is just another new Hong Kong coffee haunt; in fact, it was the food that stole the show for me. 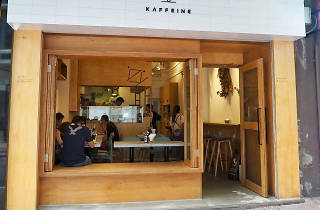 Kaffeine is a newly opened small eatery off of Queen's Road Central in Sheung Wan. Finally, after two failed attempts to get in earlier in the week, I finally scored the last stool seat at the small coffee bar. Being turned away is disappointing but on the flip side, it's busyness is a testament to its popularity. Kaffeine is small but with the aforementioned coffee bar running alongside one of the walls and an almost open front window facade on top of the usual tables and chairs, it maximises what little space it has. And the interior is simple; white and grey furniture and cutlery with wooden table tops and shelving create an almost cosy lounge effect and with attentive friendly staff on hand, it's all very welcoming. The lunch menu runs from 12 to 14:30 everyday and offers a good variety of dishes from vegetarian risotto at HK$88 through to the Australian wagyu beef burger at HK$148 with all prices including a small mixed salad or a soup of the day. The salad options change daily and were all very fresh, colourful and distinctly different and if that's all you're after, then for HK$88 again, you can just get a big bowl of a mixture of 3 of your choosing. I went for the risotto with a side salad and was really very impressed by how healthy yet sumptious and moreish it all was. I definitely left full, and so full in fact that I couldn't manage to try one of the desserts no matter how good they sounded or looked! Then onto the drinks; there is an extensive coffee menu on offer and most options offer a choice of a hot or cold serving. As more of a sweet iced coffee man myself, I went for the Iced Bailey's Mocha just to try something different, whilst my partner tried the run of the mill Americano. Both were satisfactory, but nothing to write home about. All in all, if you are not a coffee snob then sure, Kaffeine might be a place for you for a quick stop off or a catch up with a friend. But where it really shines, is in the fresh wholesome food it serves up and so, if you're looking for a light bite or a full lunch meal as well as a coffee, I for sure would recommend dropping by...that is, if you can get in!